Dimensions: length 15.5 cm, height 10 cm, width (base) 3 cm. Dimensions are approximate and indicative piece with an irregular shape. I'll sale this statue / block crystal, piece rarely encountered. 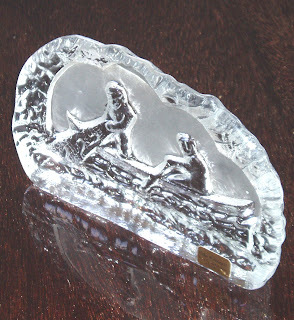 It is also called "Relief", "Block Glass", "Sculpture", "Pres-Papier" (Paperweigt). Can we say and trinket, a generic term that can encompass many of these categories, while the people runs around upon hearing this word. Therefore a full lead crystal block, representing two fishermen and their dinghy. One of them is the frame, remove the other fish purse. The technique is called "Cameo glass". Of course you can not carve in the crystal, but it is called style and such "sculptures" - worked in the negative - are made manually, often with a cast. Contrast is made of an opaque surface (v.foto 2) which is the background picture. The idea is that of a sugest ice sculptures. 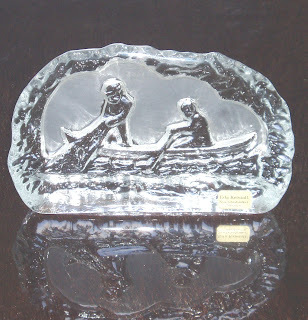 The piece is very beautiful, decorative - especially if exposed to a place with natural light. I can say that is very rare, yet we could not find another, similar, on NET. Only one time, a piece sold in 2008. The "Relief" is made in the workshop "Eda Kristall - Nya Glasbruket" Sweden, how to read on the original stickers.